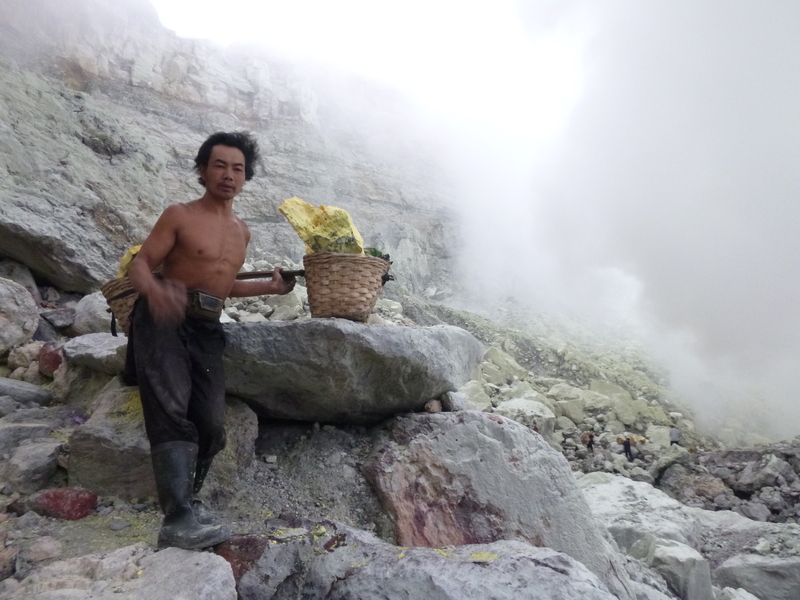 The Marvellous Men Of Kawah Ijen | Thomas Takes On…. As an avid lover of all things volcano, I couldn’t pass up the opportunity to go and visit Kawah Ijen in the far eastern part of Java, Indonesia. The volcano is most famous for its massive sulfur deposits that the locals harvest for use in cosmetics and other things. So the wake-up call came at 1am and we were scurried into the back of a car and driven for about an hour to the base of Kawah Ijen. The fact that we even made it to the base is a miracle given our drivers’ penchant for overtaking people on windy roads at high speed into oncoming traffic. I am pretty sure he almost rolled the vehicle about five times. Anyway, survived…. and arrived! We started the 3km hike to the crater rim of Kawah Ijen and had a local guy following us. Despite telling him we didn’t want a guide, he took it upon himself to walk with us for the entire way up the winding switchbacks of the hill. He would tell us things in broken English or Bahasa Indonesian on his way and point things out to us. When we started getting into high sulfur concentration areas he helped me wet down my t-shirt and tie it around my mouth so I could breathe easier. At this point I had taken a liking to him and I didn’t care if he had just dubbed himself our guide. He was cool and very helpful. I was happy to pay him anyway. An attractive look. Wet t-shirt around the mouth to stop the inhalation of sulfur dioxide. So when we got to the crater rim, then began the perilous descent into the crater rim down to where they harvest the sulfur and to the lake. It was steep and hairy trip down in the dark stopped at times by massive coughing fits from the excess inhalation of sulfur dioxide in the air literally choking your lungs. When we arrived just below the clouds I saw a glimpse of the magical blue flame that they talk about seeing in the crater. And as we continued downwards we arrived on the flat to where there were a whole bunch of men working to collect the sulfur to cart back up the hill. The crater in the dark was like a crazy world. In among the smoke there were bright patches of yellow dripping down from the hills out of these rusted out metal barrels. 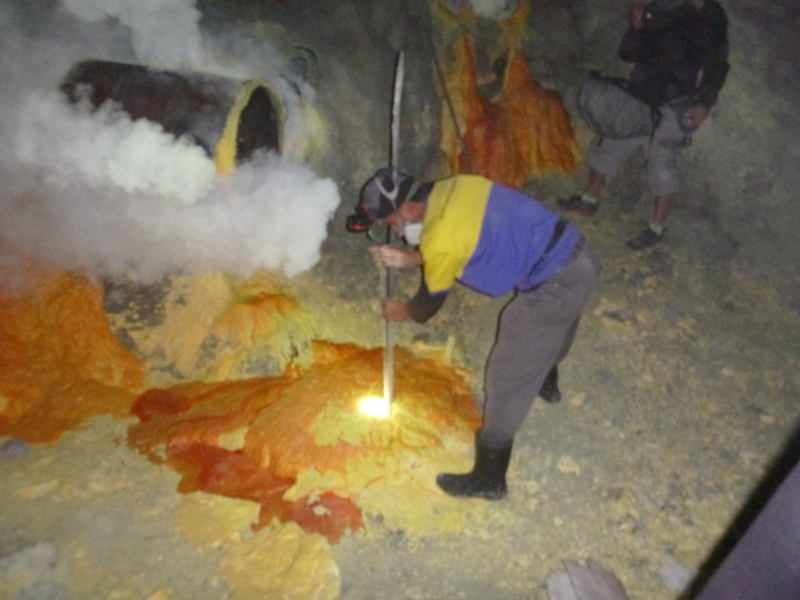 The men were taking giant metal crowbars to the solidified sulfur deposits to break them down into smaller pieces that would fit into their baskets so they could carry them. Breaking down the solid sulfur into transportable chunks. When asking them how much was in each of the baskets they told us that they were carrying anywhere between 60 and 80 kilograms back up the hill and then another 3 kilometers down the other side to the weighing station. They get paid 900 Indonesian Rupiah per kilo for this. So on average he said he made about $15 Australian dollars or 10 Euro in a day by the time they do 2 trips up and down the mountain. What a 8 AUD or 5 Euro payload looks like. My brain nearly exploded at this information. This was grueling work. Work that I would probably be incapable of. In fact, I deadlifted one of the baskets like I used to at crossfit training and while I can still pick it up, I could not do much more with it. The men were showing us their scars on their shoulders from where the bamboo baskets were cutting into their skin over the years and laughing about it. I think if I had this job I would want to cry. And yet here they are, the marvelous men of Kawah Ijen laughing about what they do for work and posing to take pictures with us flexing their muscles, sometimes with others photo-bombing in the background just to be even more funny. As the sun started to come up properly I started to take stock of the barren wasteland that surrounded me. There was a lake quite close to the sulfur deposits and according to the internet the pH of this lake is 0.5. Mind blown…. for any chemist out there you will know that this means that it is pretty much a lake of a bit less than 1M sulfuric acid (I am a self confessed chemistry nerd). It is the most acidic lake in the world and has this incredibly light blue haze to it that gives it a nice aura around the yellow and grey colours from the sulfur and the rest of the mountain. The sulfur became more yellow as the sun came up and the extent of how far you could see it expanded across the landscape. It was like being on the moon and yet not. I sat for quite a while taking it in and watching the men carry their bamboo baskets up the hill before it was time to start climbing back up ourselves. We climbed at rapid pace compared to the workers with their baskets. Even as we passed them, they continued to laugh and ask for photos with us and smile. They are incredible people that I have such amazing respect for. Before I knew it I was back to the top and on my way back down the hill among all of the greenery and foggy haze that I couldn’t see at 2am when I was on my way up the hill. 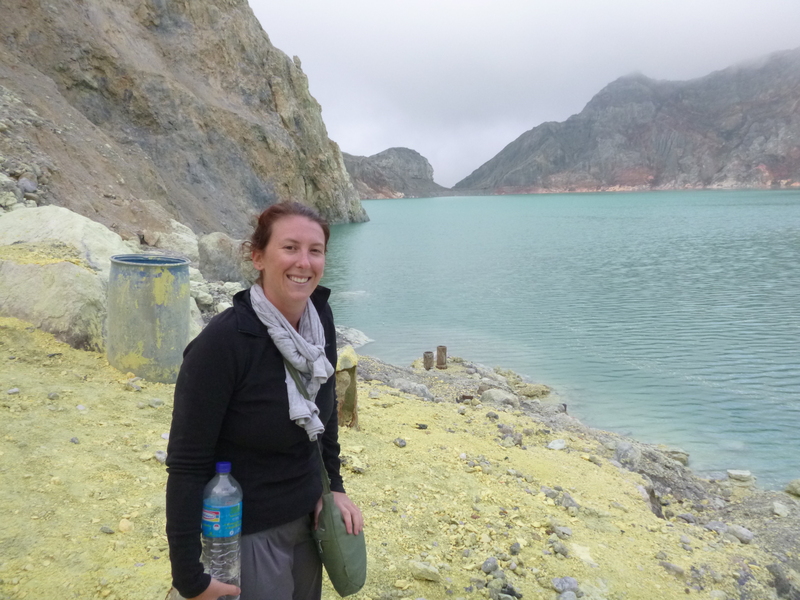 It was like visiting the sulfurous and barren wasteland of Kawah Ijen was a dream. 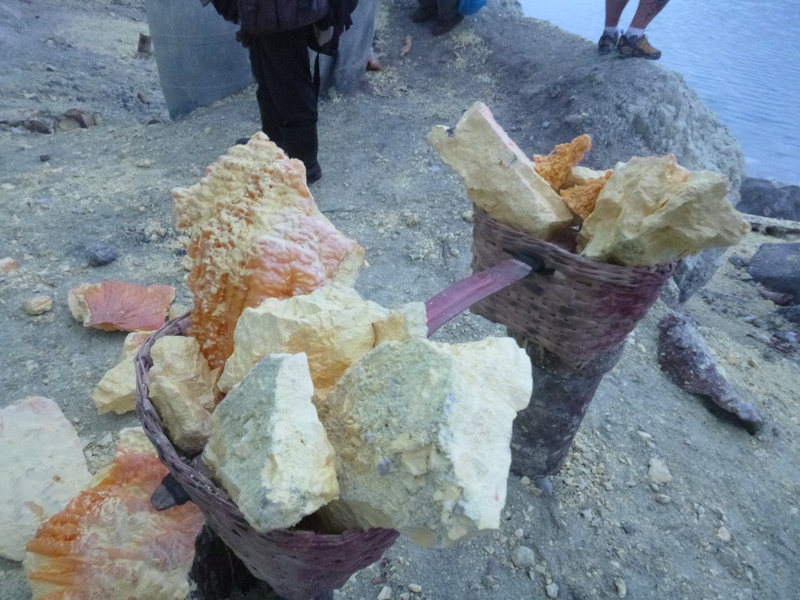 And yet here I was with the marvelous men and their baskets full of sulfur as a reminder sitting at the base of the mountain and with a bucket load of photos to always remember them by. Fantastic post i have never heard of such a thing. Is it still active? Can you breathe that stuff in and not die? Doesnt it become a sulphuric acid when it touches water! So many questions! Fascinating post! Yeah it is fairly crazy! To answer a few of your questions…. yes the crater is still active! It is constantly releasing steam, smoke and liquid sulfur from the pressure underneath the ground which allows the sulfur to be mined once it has solidified. As for the sulfuric acid, you are indeed correct! 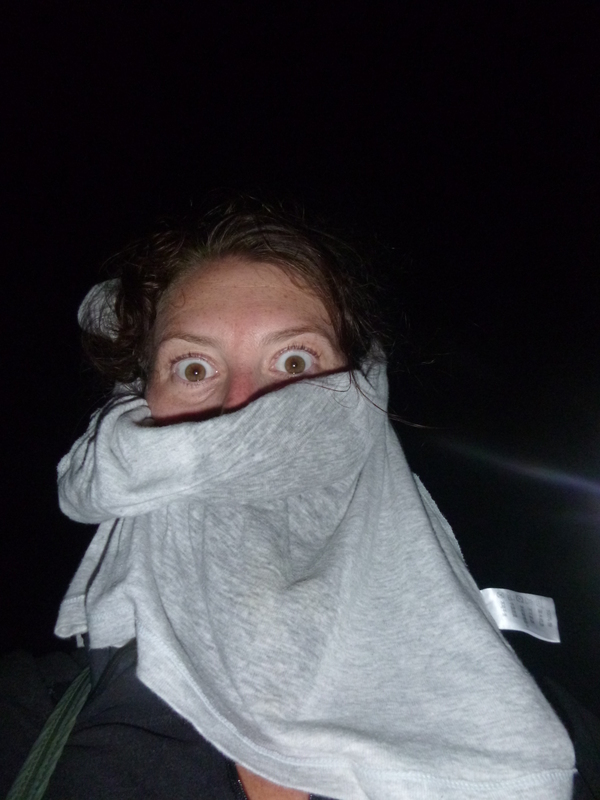 The cloth over my mouth was drenched with water so that the sulfur dioxide in the air would react with the water in the cloth when I was breathing before it would get to my lungs. If it does get into your lungs it does burn them kind of like an acid burn but is not so bad most of the time, only in areas where the concentration of gas gets really strong. The sulfur dioxide also reacts with the water in your eyes so they start to sting a little as well. 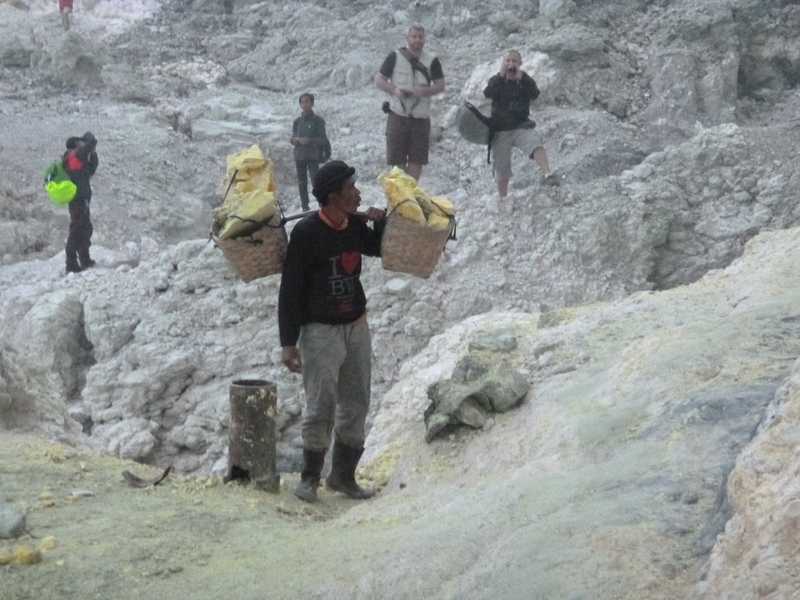 Most of the men have a shortened lifespan working in the crater because of the sulfur dioxide exposure and the sheer strain on their bodies on a daily basis. This is why they typically earn 5-7 times as much as what the average wage is for a person in Indonesia ($70USD). Some of them however do overcome this and live into old age. I assume this is a combination of wearing a mask, good luck and good genes 🙂 hope this answers your questions. Let me know if you have any others!! Amazing stuff. Tough way to earn a buck!